The Cultural Precinct encourages innovative and experimental arts practice through residencies via the existing cultural agencies. The Cultural Precinct is evolving into a spine of arts and cultural activities flexing through the campus. It will continue to develop over the next decade into a vibrant site of communication, contemplation and engagement. 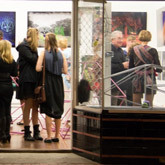 The Masonic Contemporary is a multi-purpose venue with a vision to create and foster a vibrant mulch-disciplinary hub on the University of Western Australia's Crawley campus for the arts and cultural activities. 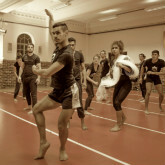 It is currently being used as a rehearsal space by the Ochre Contemporary Dance Company, as it awaits the second stage of its planned refurbishment, which will transform it into a multidisciplinary arts venue. ARTLAAB is a street front laboratory, located within the Masonic Contemporary building, and is set up as a dynamic and responsive space for students, staff and alumni and broader community to exchange in ideas about art. The experimental space is intended for development and testing ideas with public engagement.